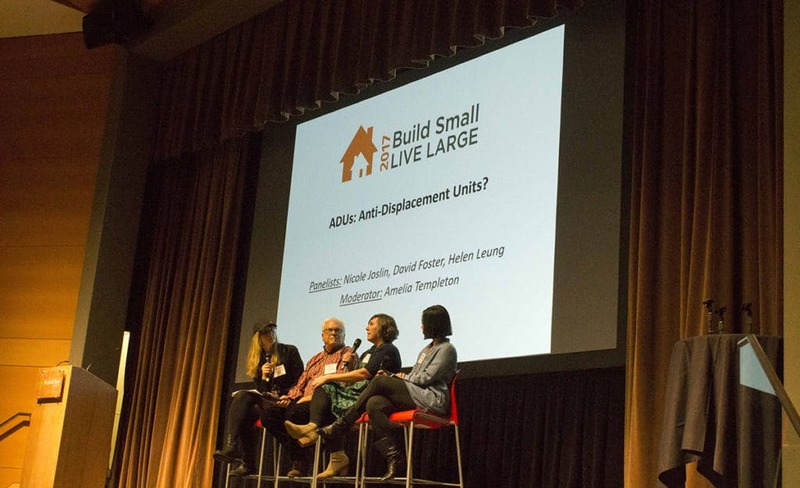 The 2017 Build Small Live Large Summit was a first-of-its-kind event, drawing the national leaders in accessory dwelling unit (ADU) development to share their experiences and prime the market to build more small homes. We want to thank everyone – from speakers to participants – for their involvement. The Summit was successful precisely because of the great mix of professions, geographies and perspectives in each session and at each event. In this wrap up to the 2017 Summit, we want to share a glimpse of the proceedings and tell you how you can visit or revisit the content now that much of it is online! 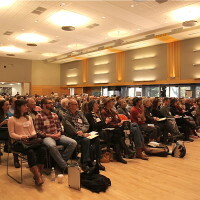 The 2017 Summit drew participants from Oregon, Washington and California, as well as from 11 other states and two other countries. Architects, designers, planners, policymakers, builders, developers, elected officials, realtors, lenders, housing advocates and academics were all in attendance. This professional mix was vital to the success of the event because ADU development is a collaborative, cross-sector process, and everyone plays an important role. Throughout Friday’s professional conference, participants learned how the political context affects the regulatory landscape, which affects the options for design and construction – and how homeowners can’t afford these projects without good financing options and a real estate community that understands their value. Many professions have a hand in ADU development, and all were in attendance at the Summit! The morning plenary laid the groundwork for many of these issues that people would hear throughout the day. First a team of locals shared how Portland became a leader in the ADU movement, and participants heard from Portland State University Institute for Sustainable Solutions Director Robert Liberty, Oregon Metro Equitable Housing Senior Program Manager Emily Lieb, developer Eli Spevak and ADU educator and consultant Kol Peterson. Then keynote speakers from Washington DC and Austin, Texas shared their experiences and perspectives on the ADU movement. Harriet Tregoning reminded participants of their common ground with one another, noting that no matter where a jurisdiction is in their process to allow or encourage ADU development, someone else in the room is either right behind them or right in front of them. Jake Wegmann encouraged cities to broaden their definition of “affordable housing” and make investments that will pay off for residents both near and long term. The last morning plenary session heard from others in markets with significant ADU stories to contribute. Denise Pinkston told the encouraging story of how California passed state-wide legislation to remove regulatory barriers for ADU development by getting a broad coalition of sponsors for the legislation – from AARP and NRDC to unions, planners, and huge California employers like Facebook and Kaiser Permanente – and by showing the Governor how this would be an effective way to get more housing without a financial investment on the part of the state. 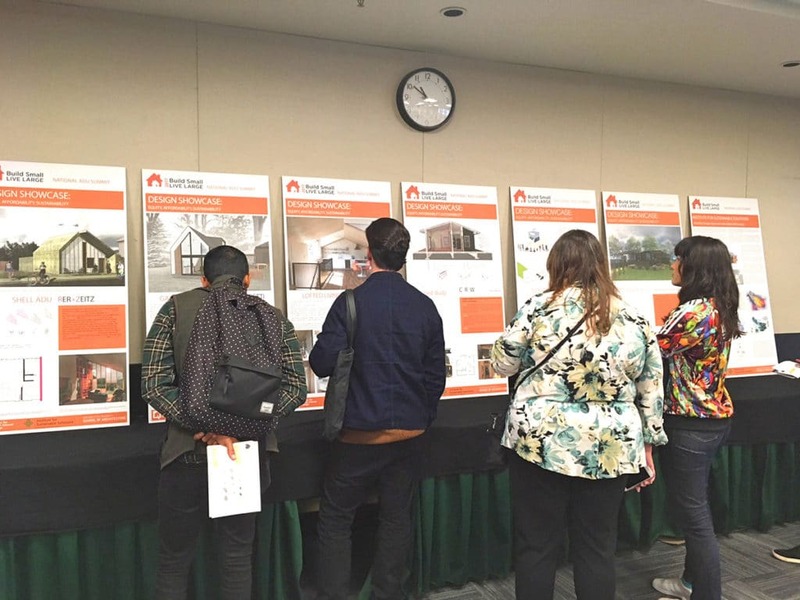 The afternoon concurrent sessions dove into specific topics of keen interest to participants, like new ADU market research, construction processes to scale up ADU development, and how small homes can be age-friendly for all ages. Whether you were able to attend the Summit events or not, you can dive deeply into any Summit session for free and online! We are happy to host video recordings of all of the sessions at Friday’s professional conference, as well as presentation slides for many sessions. You can view all the videos on this YouTube playlist, or click any session description on the 2017 Program page to watch that session’s video and download slides. 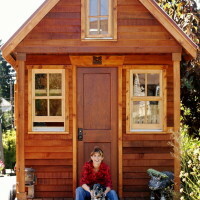 We’re thrilled to be able to offer a way for more professionals to learn why and how to support the small home movement in general and ADU development in specific, and we hope you’ll share them with your colleagues! 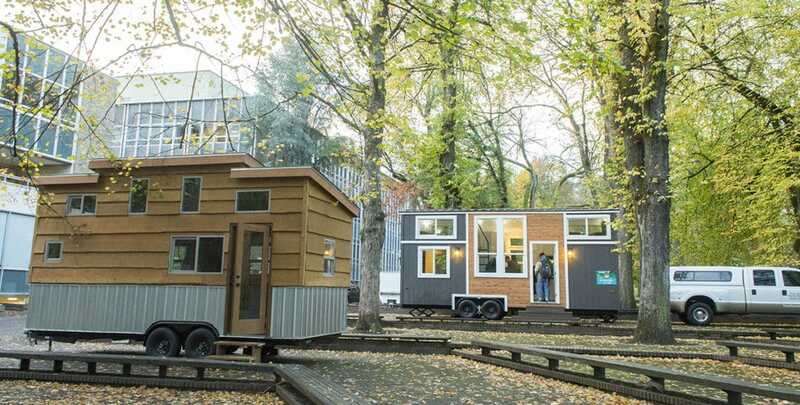 The PSU Center for Public Interest Design explains how a music festival stage became tiny homes for houseless veterans. The videos of these sessions and the experiences the participants took away will help provide tools to strengthen a small housing resurgence in America, just when we need it most. 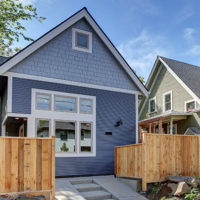 It’s vital for America to embrace housing options that both combats rising home prices and reduces greenhouse gas emissions, and ADUs are one valuable tool in that tool kit. To stay connected to these issues, there are a number of different groups and events that may be of interest to you. The YIMBY movement and Conference connects “Yes in My Back Yard” development advocates, Rail~Volution connects transportation planners invested in smart growth, the American Planning Association is increasingly aware of these new housing types, and Congress for the New Urbanism recognizes the value of dense neighborhoods. All of these organizations offer something of value for Summit attendees, and are increasingly weaving small housing into their mix of approaches and solutions. 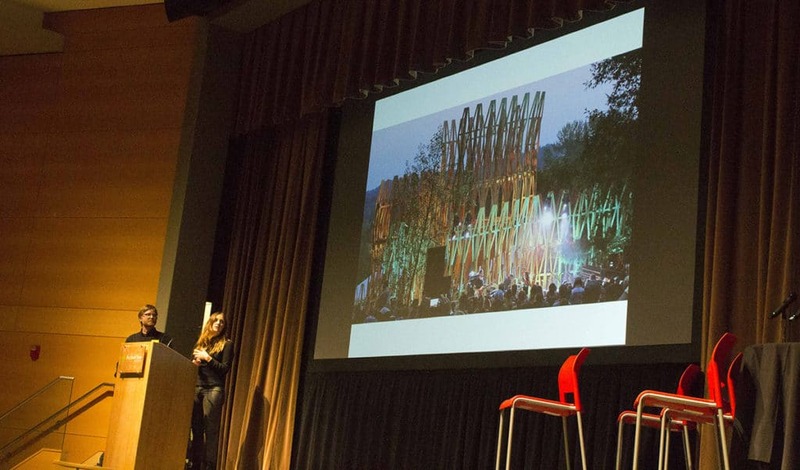 Great things happen when people get together to share their expertise and passion, and the crowd at Build Small Live Large 2017 was energized to create solutions together. During Friday’s professional conference, Saturday’s experiential tours and Sunday’s educational workshops, the participants of each event were excited to connect with others, learn new things and take new tools to where they live. Thanks so much for making the first national ADU summit a success, and for building a movement devoted to building small and living large!